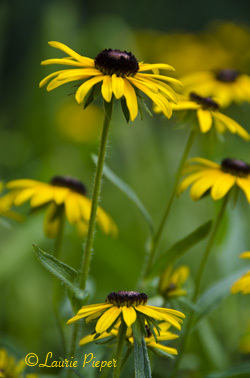 Thank goodness for Rudbeckia fulgida “Golsturm”, commonly known as Black-eyed Susans. Rudbeckia is one of the few plantings in my garden that doesn’t seem to be struggling with the weather. Despite the fact that we’ve been watering every day, a number of our plants are showing severe signs of heat stress. I suspect that some of them will need to be replaced next Spring. We lost a tree and several shrubs after last summer’s heat. Every now and then I toy with the idea taking the Rudbeckia out of my garden because it is an odd companion for my roses and Asiatic lilies; but then when midsummer heat sets in – and it is extreme again this year – I am so glad that better judgement prevailed and that the sunny faces of my Black-eyed Susans are still out there to cheer everyone who walks by. As I write this at almost 5 pm, our official temperature in Manhattan, Kansas is 109 degrees F. The thermometer in our yard is reading 112. In the last month, we’ve had 24 days with a high of 100 or over and we’re about 8″ behind in rain for the months of June and July. There is a 40% chance of precipitation for tonight, however, so everyone has their fingers crossed for rain this evening and a cooler day tomorrow. It would surely make the garden happy if that were to happen. This entry was posted in Gardening Images & Tips and tagged Black-eyed Susans, Kansas, nature, Weather. Bookmark the permalink. We’re hoping for a drop or two in Iowa tonight as well. I don’t know that anything will survive on my patio, save the hydrangea, which is turning out to be surprisingly hardy. Maybe next year I’ll try black-eyed susans..
My wish for you is a good soaking rain. I’ve seen some horrid photos of withered corn, etc. So sad. You wish came true : ) We got 8/10 of an inch last night! Thank you. I can’t even imagine how frustrating it must be to need rain so badly. We finally got some “good” rain here in PA but not before I too lost some flowers in the garden. I suppose I should be thankful I’m not a farmer, what a tough year it must be for them. Hoping you too get some “good” rain soon. The Rudbeckia will still be smiling for the rainbow. Thank you, Louise. I’m glad to hear that you’ve gotten some good rain. We got 8/10″ last night which more than doubled what we have had so far this month. At least today we won’t have to water the garden! It is still supposed to be 100 degrees today, so I think that we are in for a humid one. Good luck with your garden! It’s amazing how sturdy Black-eyed Susans are, isn’t it? We finally got some rain here on the East Coast and my Flox are flourishing but I fear I may have lost a Holly… I hope you get some heavy rains soon!